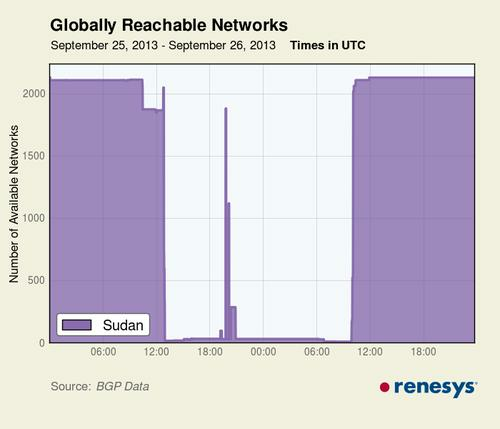 Internet access in Sudan was restored Thursday after nearly a 24-hour blackout. Sudan has regained access to the Internet after a nearly 24-hour blackout that may have been a government-directed response to violent rioting in the country over lifted fuel subsidies. Service was restored around 1 p.m. local time Thursday, according to an analysis performed by Renesys, an Internet performance management company. It was the largest national blackout seen since Egypt went dark in 2011, Renesys said. There is some debate over what caused the outage. The Sudan Embassy in Washington, D.C., said Wednesday that the Sudan government did not block Internet access. The blackout happened, the embassy said, because violent protestors burned the facilities of the Canar telecommunications company, which hosts the core of Internet services for the country. "These fires resulted in continuing Internet blackouts across Sudan," the statement said. The embassy could not be immediately reached Thursday to comment on the Internet's restoration. But the Canar Internet service provider actually lost access about 90 minutes after access was cut to Sudan's two other major ISPs: Sudatel and Zain, according to Renesys. "This is suspicious," said Doug Madory, senior analyst at the company. Because the two outages occurred independently of one another about 90 minutes apart, there was not a single technical failure leading to the blackout, he said. "That makes the likelihood drop dramatically that these two outages were coincidental," he said. There have been other cases of countries losing Internet access amid anti-government protests. In 2007 the Internet in Myanmar was shut down for two weeks following violent protests, according to Renesys. Meanwhile the demonstrations in Sudan have left at least 29 people dead, Saudi-owned broadcaster Al Arabiya reported Thursday. The International Monetary Fund urged Sudan to cut fuel subsidies when the country lost its main oil-producing territory after South Sudan became an independent state in 2011, the Washington Post reported.